In 2012, 540,000 gallons of the sweet brown stuff were discovered missing from the Canadian maple syrup reserve. Rich Cohen of Vanity Fair went to Canada to revisit the story, which is still being prosecuted in courts, and to remind us that Canada controls over 72% of the world’s maple syrup supply. That’s why it’s so dang expensive. Here’s how it works: there are 13,500 maple-syrup producers in Quebec. Each is permitted to send a fixed amount to FPAQ for sale that year, a quota that was established in 2004, even as U.S. production has exploded (up 27 percent from 2015). 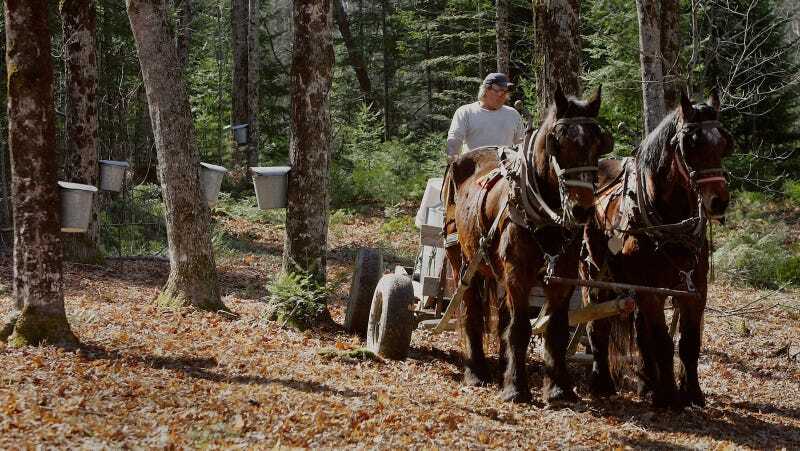 Members of the federation—Quebec’s bulk producers are required to join—give their harvest over to FPAQ, which inspects, tastes, and grades the syrup. Some of it is sold immediately; the rest is stored in the Reserve. Producers are paid only when the syrup is sold, which can mean years. FPAQ keeps $540 for each barrel, a kind of tax that pays for the advertising, the testing of the recipes, the upkeep of the Reserve, and so on. In this way, the federation steadies supply, filling the coffers in banner years, satisfying demand in fallow. In this way, the price of syrup is stabilized, benefiting even the competitors across the border. Once a year, FPAQ takes an inventory of the barrels. Gauvreau was near the top of the stack when one of the barrels teetered, then nearly gave way. “He almost fell,” Cyr said, pausing to let the picture form. A small man, astride a tower of syrup, realizing, suddenly, there’s nothing beneath his feet. Normally, weighing more than 600 pounds when filled, the barrels are sturdy, so something was clearly amiss. When Gauvreau knocked on the barrel, it tolled like a gong. When he unscrewed the cap, he discovered it empty. At first, it seemed like this might have been a glitch, a mistake, but soon more punk barrels were found—many more. Even barrels that seemed full had been emptied of syrup and filled with water—a sure sign of thieves who’d covered their tracks. The thievery was eventually traced back to alleged ringleaders Avik Caron and Richard Vallières, who rented space in the same area as the Reserve and had access key cards to the space. They managed to transport almost 10,000 barrels of syrup of their stash out of the country before anyone noticed, at first moving batches of the Reserve’s barrels to a cabin to syphon them into their own barrels, then boldly syphoning at the Reserve site directly. Though the idea of all this syrup being syphoned back and forth into barrels is unappealing, Cohen mentions that New York state has three times more maple trees than all of Quebec’s maple farms combined. If you can’t steal it or monopolize it, produce it.